Our Board and Train programs fully immerse your dog into an intense 24/7 lifestyle that will help give them the repetition and exposure they need to obtain new life skills. Although it may sound counterproductive, removing a dog from their home environment and sending them to a training camp gives them the opportunity to learn optimally. We often see dogs who are used to acting undesirably around their owners. Combining this with the lack of time a lot of our clients have for the initial teaching phase, can make training difficult especially if a dog has more severe issues. While your dog stays with us they will get several scheduled training sessions a day, socialization with other animals when appropriate, and field trips to public places. Its not all work and no play, so plenty of down time is also provided. Any dog training program is only as good as the training the owners receive as well. Before your dog comes home, you will receive the necessary hands-on training teaching you how to properly use training tools, work your dog through their obedience commands, and how to correct or reward different states of mind. A follow up session after your dog has been home for a while is included with all programs to allow us to tweak anything that comes up, or simply show off how well you are doing. Client success is very important to us, but there is no “I” in TEAM! While we want all of our clients to be successul, we can’t want the success more than you do. Consistency and 100% follow through is imperative for long term training success! Below are the different options offered for our Board and Train programs for dogs 4 months and older. Additional Weeks: $450 per week. Behavior modifications for dog hyperactivity, jumping on people, counter surfing, pulling on leash, mild leash reactivity, and excessive barking. Price includes prong collar, E-Collar Technologies E-collar, 2 hours of hands on training in your home, lifetime phone/email support, and a follow-up session 1 month after your dog has been home. This program is suitable for dogs with severe issues, such as dog-on-dog aggression, dog-on-human aggression, fear, separation anxiety, and resource guarding. Price includes prong collar, E-Collar Technologies E-collar, 4 hours of hands on training in your home, lifetime phone/email support, and a follow-up session 1 month after your dog has been home. This option is available for training clients only. Your dog will have a structured environment that will be fun, but also educational. 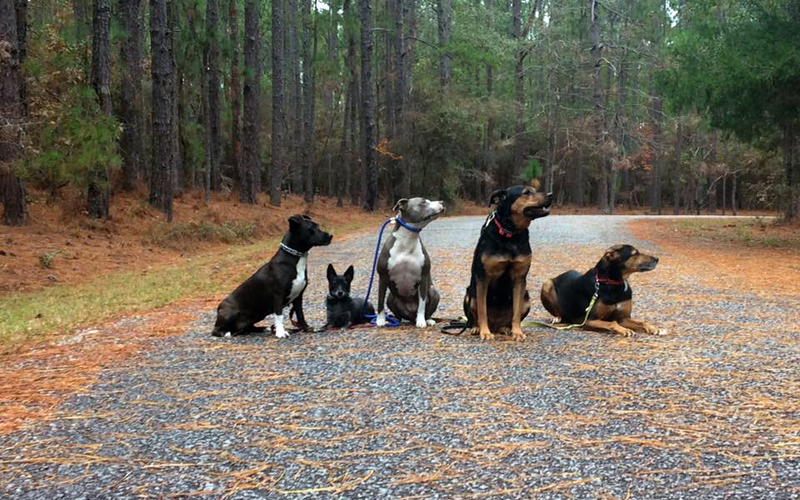 Dogs will have supervised socialization sessions, dog field trips, and a training reinforcement as needed. Full payment is due at the time of booking to reserve training spots. Training fees are nonrefundable but are transferable to another date. An electronic Square invoice will be sent and can be paid with all major credit and debit cards. Reservations are NOT held without a deposit. Additional fees for our long distance clients will be added to the total cost of their training program. This is to cover the cost of traveling for your dog’s go home session(s).